Email archiving continues to grow in market demand despite the downturn, in December the United States Securities and Exchange Commission sent an open letter to CEOs of SEC-registered firms imploring them to not ignore or cut short of their compliance responsibilities because of the economic downturn. Some of the SEC mandates for these firms includes proper email archiving and email compliance. The message is simple: do not cut corners just because things are getting tough, cut cost elsewhere but not email archiving. 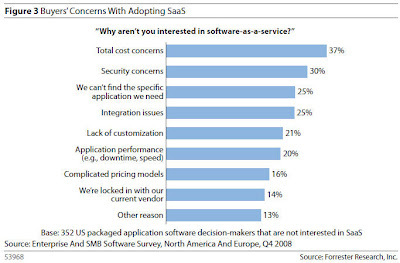 Interesting enough, according to ZDnet last week, Forrester disclosed their Q4 SaaS research report which indicated an accelerated growth with SaaS adoption amongst companies looking to seek cost cutting alternatives. Combine the two and you get a growing market demand for "Hosted Email Archiving" in a shrinking economy. There is no doubt that customers want the benefits of email archiving but this time they want it on a SaaS (pay-as-you-go) model. Pointivity partners can now offers email archiving (Global Relay) along with enterprise communication (Microsoft Exchange), collaboration (SharePoint), and wireless email (BlackBerry, ActiveSync) as part of a complete hosted solution with private label capabilities. Our partner program is designed to enable partners to be more competitive and flexible while building a strong recurring revenue stream.